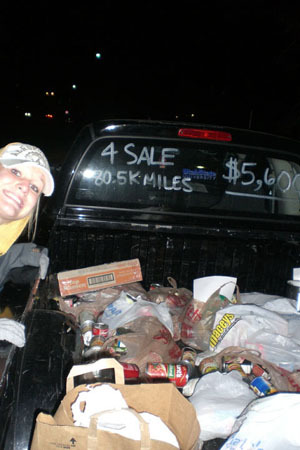 December 5, 2008 | The goal was 15,000 pounds of food. But Nov. 24, volunteers for the "Stuff-a-Bus" service project not only met the goal but exceeded 20,000 pounds of donated food for the Cache Community Food Pantry. 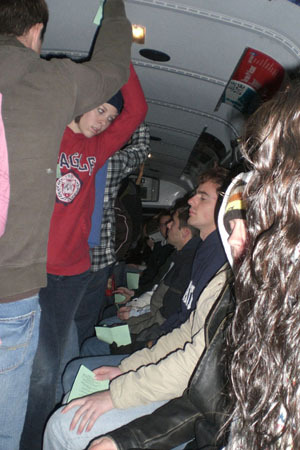 Despite the cold, several hundred students showed up where they boarded four Aggie shuttles and spread out through Logan to collect as much food as they could. "It's awesome how many people came to help," said Geoff Andrews. "It shows the compassion and the true character that students have and how much they want to help others have a better life." As the students drove from block to block, many talked about service projects they had done and how much the projects had affected their lives. "My favorite service project was the Silver Rush that we did every year at my high school," said Matt Miles. "We would choose a local service center or shelter that needed help and we would have a race between the classes to raise money and food and then donate it at the end of the month." Even though it seems like there is always an overabundance of service opportunities during the holiday season, Andrews thought it was important that people realize service needs to be done all throughout the year. "It seems like people do the most service during Christmas time," said Andrews. "Even though it's a good thing service is being done, we need to realize that people aren't only in need during Christmas. Just because the holidays end, it doesn't' mean that the problems go away. We need to help them all the time." The Val R. Christensen Service Center on campus tries to make sure service is a year round effort. The service center, who put together the Stuff-a-Bus activity, has over 15 clubs that do service projects like the Special Olympics, volunteering at the senior centers in Cache Valley, recycling initiatives, and supporting students who start their own projects on campus.